Why is Google Chromecast so popular with users and how can we work with it to optimize the viewer’s quality experience? 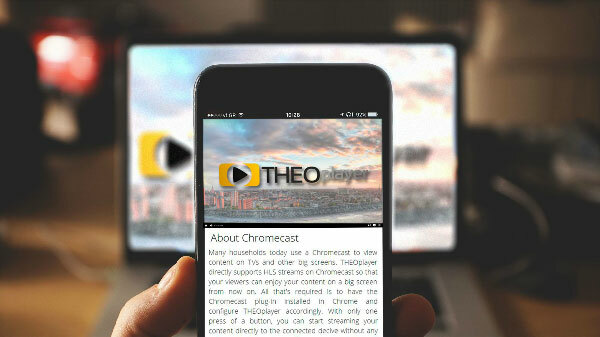 In this blog post you will learn about the success of Chromecast, its key concerns while casting your content, and how THEOplayer can help you to offer an optimized viewing experience to the viewers of your video service on Chromecast. Why is Chromecast so successful? Over the past years, consumers have been introduced to hundreds of different smart devices and manufacturers, which in return has led to a tsunami of unlinked technologies. In the same way that we managed to integrate HLS and MPEG-DASH in our video player, there is a great need for integrating and linking these technologies in order to provide ease of comfort to the end user. And this is where Chromecast comes into play. Chromecast is a device developed by Google that simply plugs into a TV for seamless playback of content from a smartphone, tablet, PC or laptop. Since launch in 2013, more than 30 million Chromecasts have been sold, according to Google’s most recent figures, making it a near essential platform for content owners to address. And every good idea can be improved, so our THEOplayer Chromecast Receiver App SDK can make a difference for your business here. Despite the comfort that Chromecast offers to millions of its users, it also comes with some challenges for content publishers and video services. When a device starts casting, it needs to be able to play, pause, seek and fully interact with the content the same way as it would on the browser or in a mobile app. However, achieving this is much easier said than done. You can always get your own solution by building it on your own, but this will require a great amount of money, time and effort. Moreover, this would increase the possibilities of getting bugs and natural problems from an untested SDK. From various subtitle formats to multiple audio choices, the video player on Chromecast needs a user interface that is built specifically for TV. And what about the role of the video player in the whole video streaming ecosystem? Whether it is DRM content protection or tracking what is being watched or monetization of content via advertisements, it is vital that these interactions also occur when your content is being played on a Chromecast. THEOplayer Chromecast Receiver App SDK integrates all of these features so you don't miss anything. Clearly, the casting device and the Chromecast need to work perfectly together. We provide THEOplayer Chromecast Receiver App SDK which does just this. It is a video playback library designed and optimized for Chromecast and includes a specific UI which works smoothly with THEOplayer on any other device, be it PC or mobile with full support for multiple audio and subtitle formats. To simplify things further for video services, THEOplayer also supports DRM pre-integration, analytics advertising and advertising playbacks, whereas without you would need to build it yourself. THEOplayer is ready to go, right out of the box. For example, if you are using THEOplayer on PC and you start casting to THEOplayer on Chromecast, the same pre-integrations are automatically carried over – your analytics' solution will still report, your DRM will still work and your advertisements will play without any challenges. That is how easy THEOplayer makes it for video services to cover all different platforms. THEOplayer doesn’t just optimize content for video playback on Chromecast. It is the best and easiest solution for video playback on any device. Get in touch with our team of experts to know how you can integrate this technology in a player solution.